If you're still scratching your head over the idea of a hybrid Psycho, let me explain further. Remember back a couple years ago to Disturbia, a decent movie starring Shia Labeouf that was a new spin on Alfred Hitchcock's masterpiece Rear Window. 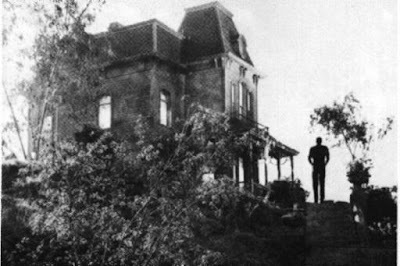 It seems that FilmNation and A Bigger Boat have it in their head that the same can be done with Psycho. The film will be directed by Mark Tonderai off of a script penned by David Loucka. Loucka's script was developed from a story written by producer Jonathan Mostow, who of course came up with the idea from Hitchock's classic film. Still with me? Hope so. The project is titled, "House at the End of the Street" and follows a family who move in across the street from house where a massacre happened (essentially the ill-fated Psycho house). The new to the neighborhood teen befriends the only person still living in the house (basically Norman Bates) and trouble ensues. Yes, I'm generalizing the story. The movie is being pitched around town as what Disturbia did for Rear Window, 'House' will do for Psycho. In my book, those are some enormous shoes to fill. Disturbia felt like one in a million, but who knows Loucka's script just may be fantastic. The meat of this post comes in the form of a casting scoop. THR is reporting that Jennifer Lawrence and Max Thieriot have been selected as leads for the hybrid. Lawrence will play the teen girl who befriends the sole survivor, while Thieriot will play the quasi-Norman Bates character. I can't say anything bad about either actor selected because I haven't seen enough to do so. Thieriot played the young version of David in Jumper and the only movie I've seen Lawrence in was Garden Party (a movie I wouldn't recommend). "House at the End of the Street" is set to go in front of cameras this July in Ottawa.